Have you seen our Crafter's Corner? From antique pieces of silver plated spoons and forks, Craig Fowler makes wind chimes, Christmas ornaments and Pocket-Angels. I have been knitting for 35 years. Although I have done many sweaters in my time, they are not the only things that can be knitted. So may I introduce you to other lovely items? We specialize in handcrafted country and Victorian creations. 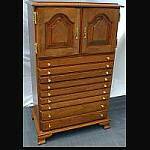 We offer country storage chests and Victorian fireplace screens and much more. Our items would make a unique gift for others or just for you. Keeper of the Stones began in 1993 after meeting our mentor Richard Davis. As a disabled teacher of earth science, he sat with us for hours and taught us about rocks and minerals. Thank you Richard for you are truly the original Keeper of the Stones. Kitchen Quiltables by Lois��Check out our beautiful selection of hand-quilted placemats and table runners. 100% washable cotton. Kraft Art Studio��We hand paint scenes on fireplace screens, towel holders, tables and other handmade items. We also have limited edition prints of our paintings on our web site. M-and-O-World-of-Gifts��We offer many unique gifts for any occasion. Check out our Country Shoppe for birdhouses, garden and home decor, handmade soap, gift baskets, jewelry and lots more. We offer retail and wholesale. Handcrafted wooden toys made to last for generations in solid cherry, walnut and oak. Harold creates only the finest quality jewelry boxes. Handcrafted quality wood products made from the finest materials�there is something for everyone. The Yarn Basket��Nestled in the heart of the Cumberland Valley lies a wonderful haven for knitters, crocheters, weavers, and needlework enthusiasts. The Yarn Basket is Central Pennsylvania's Home for knitting and needlework. With our large selection of yarns, you can very easily make this your only stop for your needlework supplies.